This is surprisingly another one that took me by shock. Never seen it, or even heard of it. Twilight Time choose another solid choice to bring to Blu-ray. Was a great experience seeing this for the first time. A great experience because of the wonderful product that Twilight Time has honored this film with. As I have stated in many of my reviews, I love to come across pieces of cinema I had no knowledge of, or at least it has passed me by, and I have never gotten a chance to see it, enjoy it, or even loathe it. 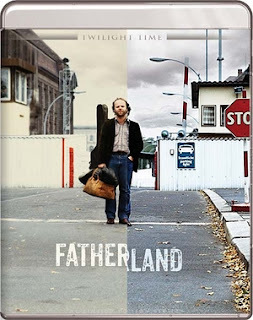 Fatherland is a solid film that expresses a great story, and equally wonderful acting by all involved. This was originally titled Singing the Blues in Red. This is a drama that sticks out as something unique and memorable. It’s a small film that packs a bunch in the dramatic storyline, acting and most of all the direction. This is directed by a truly gifted cinema maker, Ken Loach. Loach has created and mastered a dynamic career of film throughout his many years. Started directing in 1964, and as of this writing still going strong today. He directed one of my favorite films, a masterpiece of film from 1969, the wonderful, must see Kes. Also directing another Twilight Time release 1996’s Carla’s Song, which you can read my review for it here: Review . He has done many wonderful films, some greater than others, from TV to film, he has a mastery that shows in his end result, and Fatherland is one of those little gems of dramatic perfection. Now all one has to do is look at the ultimate style that Loach directs in. His films are about average people, and their struggles, or situations. There about the drama one goes through. His films like Fatherland are about everyday people, and there plights. They are not about falsehoods, or overdone adventures, they are about believable subjects, and basic everyday life unfolding on screen. His characters are one you can relate to and understand, and somewhat become them. Fatherland is a prime example of that reality. Loach is a very political person, and his ideas, and beliefs sometimes bleed over into his films. He is a director that knows what he wants to do, expresses it, and gives solid films to the public. Twilight Time I feel has done another wonderful job in picking a diverse reality of film. Fatherland is a prime example of a film, mostly lost by time, but resurrected by a lovely blu-ray to see once again. Written by another equally brilliant person in film making, Trevor Griffiths. He has written many wonderful films both great and small. A personal favorite of mine, 1981’s REDS. Mainly a TV writer, and as of this writing, retried, or at least has not written anything since the late 90’s. The plot is your main character, singer Klaus Ditterman, leaves East Berlin with his family to West Berlin. An American recording music company is going to use the situation that Klaus is a part of, to progress his music career. Klaus you see is a person that basically is an unwelcome, because of political reasons. Klaus soon decides to tract down his father who left many years before in a same situation as he did. Alongside him is Emma a French Journalist who happens to know where his father is, and information on his father. So begins a journey of discovery, and an unfolding drama. Last but not least one has to mention the cinematography, camera department. The man behind it is non-other than one of the most important cinematographers in cinema. Chris Menges. Chris has worked on many, many feature films, both great and small, just to name a few, 1984’s disturbing and brilliant The Killing Fields, 1986’s The Mission, 1996’s Michael Collins. The much underrated 2001's The Pledge. A personal favorite of mine 2008’s The Reader. Might I add he was the cinematographer for another Twilight Time release, Angel, which you can read my review for it here: Review . He also worked on Loach’s other projects, Kes. An eye for perfection, and it shows. A lovely choice of a film to express on this new outlet by Twilight Time. A solid film through drama and storyline. Equally impressive acting. Gerulf Pannach gives a great performance as your lead character. This is his only acting part. So this was his debut, and only film. Sadly he died at such a young age of only 49 years old. Cancer took a really good singer, song writing genius. Thankfully his memory is honored with being able to watch this film on a top notch blu-ray. Also starring Fabienne Babe as the character of Emma. She is brilliant in this performance, and truly is something to remember. A flawless undertaking of character on screen. Babe showcases a character to remember. Solid direction, solid acting. Solid script equals a solid film. Never seeing this before I have nothing to compare it to, but seeing it here on this blu-ray, the imagery is perfected. Vibrant in color, and crisp texture. The audio in solid. There really is no pin pointing or picking apart about this reality. I feel this is a great transfer and a wonderful high quality product. Slim Pickens with this release but you do get the wonderful isolated music and effects track. Being a music lover I always look forward to this special feature. The music in this film is done by many performers. Beja Bartok. Bartok has vast career in the music world. Working on the soundtracks to some classic TV and Films, such as the original Doctor Who. The 1980’s horror masterpiece The Shining. 1999's classic Being John Malkovich, among many others. Benjamin Britten, has worked on many important film projects such as 2002’s Talk to Her and 2012’s Moonrise Kingdom among many others. Others who worked on the Fatherland music was composer Christian Kunert, and most of all the star of Fatherland Gerulf Pannach as actor and composer. Another fantastic product by Twilight Time. Another unique and interesting film that I had never seen, and so it’s always a great experience to see a film for the first time. A great choice of film. A great product in audio and video. Twilight Time did it again. Highly Recommended.